The mysterious nature of outer space makes it a popular theme for kids from any walk of life. 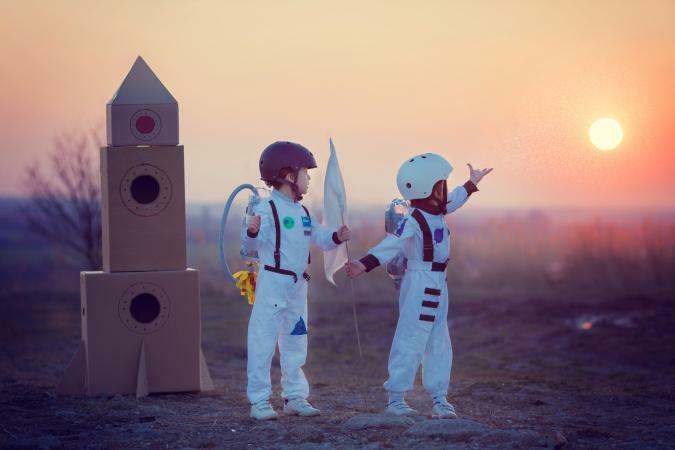 The promise of adventure and exploration embodied by space travel can be incorporated in a variety of fun games for all ages. 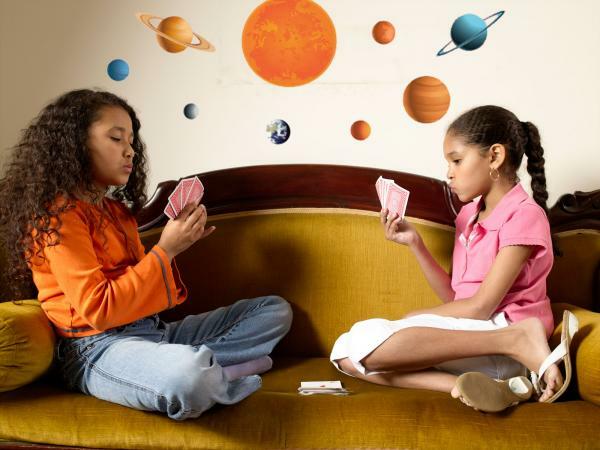 This DIY card game will teach kids about the different kinds of planets while encouraging some competitive space-inspired exploration. Groups of three to seven players will have the most success with Solar System Swipe. Children ages eight and up will best be able to grasp the concept of gameplay. The game should take anywhere from 10-30 minutes. Players must 'play' one card from each suit (heart, diamond, spade, club) in any number from two to ten to represent the terrestrial planets (Earth, Mars, Venus, Mercury). Players must also 'play' one card from each suit in any of the 'face' cards (Ace, King, Queen, Jack) to represent the gas planets (Jupiter, Saturn, Venus, Neptune). The first player to collect all the 'planets' (four numbered cards - one from each suit and four face cards - one from each suit) wins the game. Deal seven cards to each player then stack the rest of the cards facedown in a pile in the center of the playing area, called the draw pile. Start with the youngest player and move clockwise for gameplay. On each player's turn, he must take the card from the top of the draw pile or the discard pile, 'play' any appropriate cards by laying them down in front of him and place one card from his hand into the discard pile. Play continues until one player has collected all eight 'planets.' This person is the winner of the game and has 'swiped' all the planets from our solar system. Participants must use logic and communication to Align the Planets in this timed, cooperative game for kids ages seven and up. Gameplay can take anywhere from two to ten minutes depending on the size of the group and the time limit chosen. The game works best with nine players but can be adapted to include more. 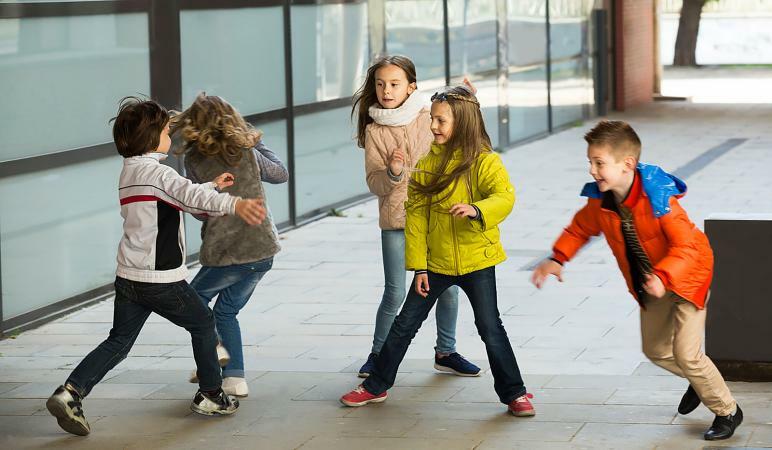 Choose a time limit based on the age and size of your group, 2 minutes for older kids in a group of nine or ten minutes for a younger group of 12 would be appropriate. Set the timer for the chosen time limit. On each index card write the name of a planet (Mercury, Venus, Earth, Mars, Jupiter, Saturn, Uranus, Neptune) and its size relative to the others. For example, Jupiter is the largest planet and smaller than the Sun. On the last card write 'Sun - Largest.' For groups larger than nine you can also incorporate the names of various moons. Hand each player a card and ask her to read it. Direct players to put themselves in order from smallest to largest within the chosen time limit. Start the time and encourage positive communication. If the group completes the task before the timer goes off, they win. 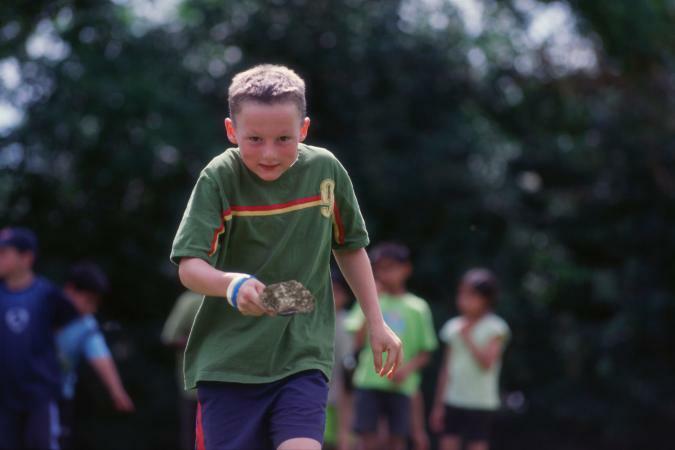 The Moon Rock Relay is a slow-motion competitive relay race best suited for large groups of children ages four and up with at least four members on each team. Gameplay requires a large, open space and should take no more than 10 minutes for one round. Place a bucket at the finish line for each team, each one a few feet apart from the last. Leave a pile of rocks, one for each team member, at the start line directly across from the team's finish line bucket. Sort the group into equal teams. Line each team up by a pile of 'moon rocks.' This is their rocket ship. On 'Go,' the first player on each team must pick up a 'moon rock' and carry it to their team's bucket. Players must move like astronauts on the moon leaping in slow motion as if there were no gravity. Once the player reaches the bucket, he should place the moon rock inside it and return to the end of the team line, still moving like an astronaut. When the first player gets back to the start line, he should tag the next player in line. Play continues in the same fashion until all moon rocks have been deposited in the team bucket. The first player must then leap down to the bucket one last time to retrieve it and return it to the starting line. The first team to get all their 'moon rocks' in the bucket and back to their 'rocket ship' wins the game. A classic game of tag can be transformed into an outer space adventure with just a few adjustments. Gameplay will be most successful in a gym or large, open space with groups of 10 or more kids ages five and up. 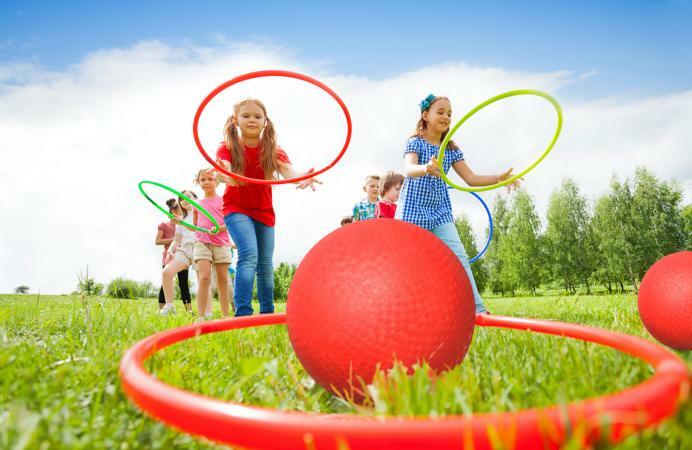 Place hoops lying flat on the ground in different areas of the playing field. Designate approximately one-third of the players as Astronauts and the rest as Aliens. Start the game with all Astronauts at one end of the playing area and all aliens at the opposite end. Direct all Astronauts to move only as an astronaut would - in slow motion with leaping movements. Direct all Aliens to move like an alien might - waddling with hands above head, or crawling. If a player goes inside a hoop (or 'crater'), he must remain there until another alien tags him out. Astronauts must try to capture all the Aliens by tagging them. If an Alien is tagged, he must exit the playing field for the remainder of the game. Once all Aliens have been caught, the game is over. Saturn Ring Stack mimics the classic midway game of ring toss but adds in an active element. Gameplay requires three participants and is appropriate for children ages six and up. The game can be timed for added competition and should take no longer than five minutes per player. To give Saturn back its rings by tossing hoops over a moving ball. Saturn has an undetermined amount of rings encircling the planet. There are four main groups of rings, so the goal should be to get four rings on the ball. Two Rollers, can be adults or children, should sit opposite each other about 15 feet apart. The Player should stand in the center of the two Rollers, but not in line with them. On 'Go' the rollers will begin to slowly roll the ball to one another in a straight line. The Player must throw hula hoops at the moving ball (Saturn) and try to land a ring so that it encircles the ball. When the player lands the first ring, it should be removed and placed in a pile. Gameplay continues until the Player has landed four rings over Saturn. Similar to Simon Says, 3,2,1 Blast Off! requires great listening skills. 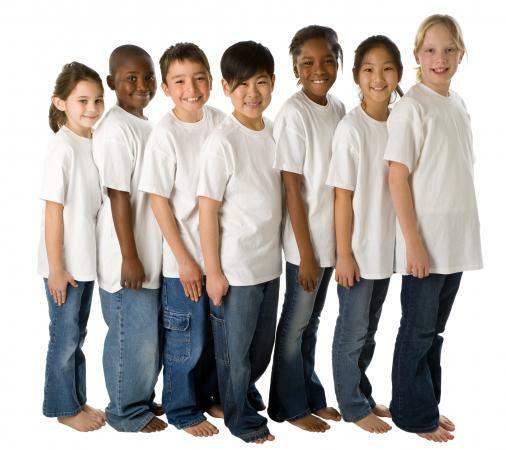 Children ages six and up in small or large groups can play the game. Gameplay times will vary but should take no longer than 10-15 minutes. An open area large enough to fit the group is required. Players will need to be briefed on the various positions that will be called out during the game. 3 - Players must stand tall with legs together and arms above the head with hands touching, forming a rocket ship shape. 2- Players should keep rocket ship shape but slightly bend elbows and knees. 1 - Players should keep rocket ship shape and squat all the way down with hands in front of their face. Blast Off! - Players should burst hands and legs up into the air as if they are a rocket ship taking off. One person should be designated as Ground Control and stand in front of the entire group, facing them. For younger children, it would be best to have an adult play the role of Ground Control. Ground Control should yell out one command at a time from those listed above. The entire group must then assume the appropriate position. If a player assumes an incorrect position, she is out. The winner of the game is the last person standing, who has correctly followed all commands. There are many elements in outer space that can serve as inspiration for children's games. Everything from space travel to stars and aliens can add fun to seemingly standard activities.